CHICAGO (WLS) -- The magic of the holidays, Chicago style, is captured for viewers around the country with musical performances, beloved Walt Disney World characters, and dazzling fireworks, as more than a million twinkling Michigan Avenue lights set the stage for the LIVE broadcast of the spectacular BMO Harris Bank Magnificent Mile Lights Festival, Saturday, November 18 from 6-7:00 p.m. on ABC7's main channel and 7.2 digital channel. 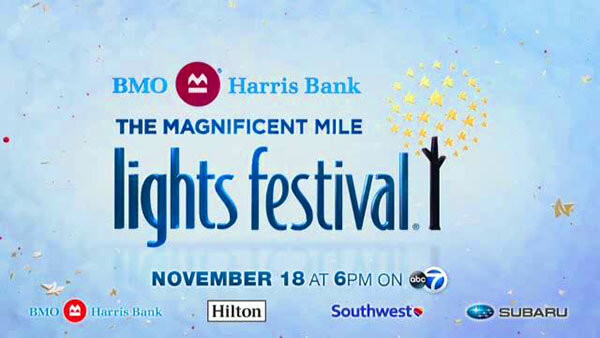 Watch the BMO Harris Bank Magnificent Mile Lights Festival. The Magnificent Mile Lights Festival was also streamed LIVE on the ABC 7 Chicago News app and abc7chicago.com. The festivities are also available on-demand at abc7chicago.com. Encore broadcasts will air Saturday, December 2, from 4-5 pm; Saturday, December 9 from 11pm-12 am; Sunday, December 10 from 1-2:00 pm on ABC 7 Chicago. The hour-long special, showcasing the country's largest evening holiday celebration, was co-hosted by ABC 7 Eyewitness News Anchors Cheryl Burton and Alan Krashesky. ABC 7's Janet Davies spotlighted a couple of acts in the procession including Broadway In Chicago's fun new musical, Escape to Margaritaville and ABC 7 Eyewitness News Anchor Terrell Brown captured the magic from the street. This was the 26th anniversary of the sparkling Lights Festival and the 12th consecutive year this much anticipated tradition was broadcast to Chicago audiences on ABC 7, the most watched television station in the city. Throughout the holiday season, the special will also be watched and enjoyed by a national audience, via syndication. Broadcast times are available in local listings. In the first official parade of the holidays, Grand Marshal Mickey Mouse, escorted by the lovely Minnie Mouse, illuminated over one million lights on 200 trees along "The Magnificent Mile," one of the grandest avenues in the world. (Mickey Mouse has served as the Grand Marshal for the past 25 years; this is the ninth time Minnie Mouse joined him.) Appearing on an awe-inspiring float, the world's most famous couple led the way for more than 40 breathtaking floats, helium-filled balloons, including the larger than life Hubert the Lion; classic characters from the Walt Disney World Resort including Woody and Jessie from Toy Story; six lively marching bands from across the country and musical performances by top artists. Viewers were treated to a lively performance by the cast of Broadway In Chicago's musical comedy ESCAPE TO MARGARITAVILLE. The spotlight also shined on performances by the popular Indie band sensation, Echosmith; seasoned American Idol winner Taylor Hicks, Disney's newest country music sensation Temecula Road, The Voice finalist Billy Gilman, singer-songwriter Alec Joseph, jazz singer Shemekia Copeland, and American singer Melinda Doolittle. Asher Angel, one of the stars of the Disney Channel series "Andi Mack", also made a special appearance this year. Members of the ABC 7 Eyewitness News team-- featuring Rob Elgas, Mark Giangreco, Judy Hsu, Larry Mowry, Phil Schwarz, Cheryl Scott and Ji Suk Yi spread good cheer as they rode atop ABC 7 Chicago's whimsical float during the parade. The Magnificent Mile Lights Festival is this weekend, and the grand marshal is celebrating! The live broadcast's grand finale lit up the sky (and children's hearts) with a dazzling fireworks display over the Chicago River, just as Santa made his exciting arrival on the scene, as he waved from a beautiful and magical float!